This level starts right in the beginning and leaves nothing out. Classes #1 and 2 teach you exactly how to read and write Korean. Then from class #3 we get into the basic sentence and how to SPEAK Korean. Throughout this level you will grow comfortable with the basic Korean sentence as well as learn some very common and useful questions (and answers to those questions) that you can and will use in everyday Korean. 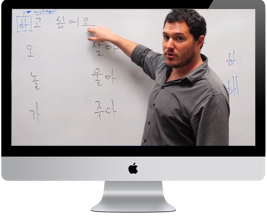 In class #11 you will also get introduced to speaking in the past tense in Korean. Class #4: How much is this? Class #6: What time is it? Class #8: There is cheese! Class #9: Where's the bathroom? Make your life (in a supermarket and elsewhere) a whole lot easier with one simple question, how to ask - and answer! - where something is.